In the first save, Tommy has 100 HPs, 150 for Health and Armor, has the in-finite sprint, and is fireproof. He has a lot of ammo for the best weapons in each category but hasn't done any main missions. I recommend using that save for the main missions up to "Phnom Penh '86." By the time of "Phnom Penh '86," missions have taken his .357, M4, and Minigun, so I replaced his ammo for those for a second save file. I recommend that as a belated starter save to base subsequent saves on. I used Alper Saracoglu's GTA Vice City Adminstrative Console to add EP/DP/BP/FP vehicles to garages. 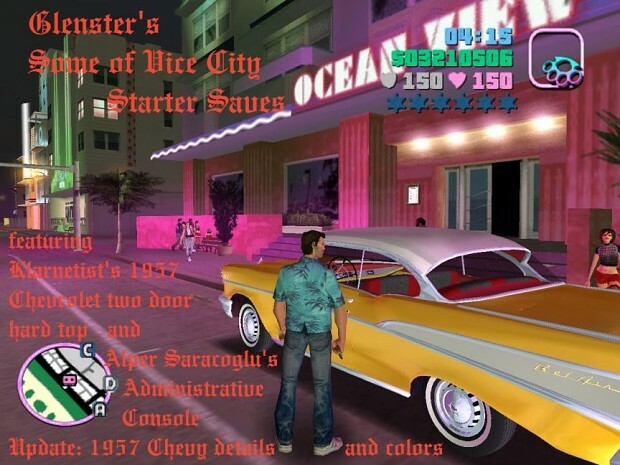 There's an optional handling.cfg file that mods the Sentinel (for "The Driver" and the "Sunshine Auto Races"), the Angel (it's also good for those races--it's like the competitors' bikes in "Alloy Wheels of Steel"), and RC Bandit (thanks to Demarest for the RC Bandit figures). The original handling.cfg is included for those who forget to make a copy of it first. Update Dec.2, 2011: I improved the installation instructions. and I added a few details to some of the instructions here and there. Update 4/10/2011: I added a carcols.dat file which lets you use some of the 1957 colors for the 1957 Chevrolet Bel Air, some different colors for the Sentinel, and school bus yellow for the Bus. hmm... like 7 years too late.